What it's like to be a Time Traveling Horse Lord of a Dark aspect. Martin Wilsey: The Witness Paradox: NEW from Tannhauser Press: THE WITNESS PARADOX A Time Traveler Anthology Short stories from the minds of yours truly and other wonderful authors! Find out just how a failed Bloc Québecois politician and a lowly University Security Guard accidentally decide, Let's Kill John A., or rather John Wilkes Booth Must Die. Scissors cuts Paper covers Rock crushes Lizard evades Large Hadron Collider cures Zombie grabs Sonic Screwdriver reveals Invisibility Cloak fascinates Spock bends Scissors stabs Zombie shreds Paper reprograms Large Hadron Collider disenchants Invisibility Cloak hides Paper muffles Sonic Screwdriver shatters Rock trips Zombie brains Spock vaporizes Rock rips Invisibility Cloak confuses Lizard slimes Sonic Screwdriver splits Scissors decapitates Lizard poisons Spock deactivates Large Hadron Collider magnetizes Scissors unravels Invisibility Cloak frightens Zombie swallows Lizard eats Paper disproves Spock replicates Sonic Screwdriver dismantles Large Hadron Collider nukes Rock blunts Scissors. See Gestures below for details on how to make each item. The Sonic Screwdriver doesn't work agains complex, organic matter. Organic items are Lizard, Spock, Zombie, and Paper. The Invisibility Cloak is magic. Organic matter defeated by magic. The Invisibility Cloak is not organic because it is magic. The Sonic Screwdriver defeats inorganic materials. The Invisibility Cloak is damaged by inorganic matter. 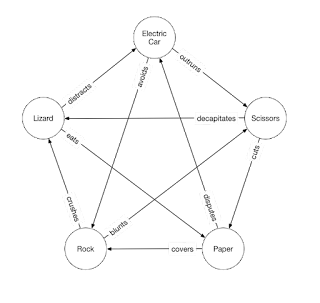 Inorganic items are Rock, Scissors, the Large Hadron Collider, and the Invisibility Cloak. The Invisibility Cloak is inorganic because it is magic. Brains overcome Large Hadron Collider. Brains are found in Spock, Lizard, the Sonic Screwdriver, and written on Paper. Tools defeat Zombie, except for tools which only work on organic matter. 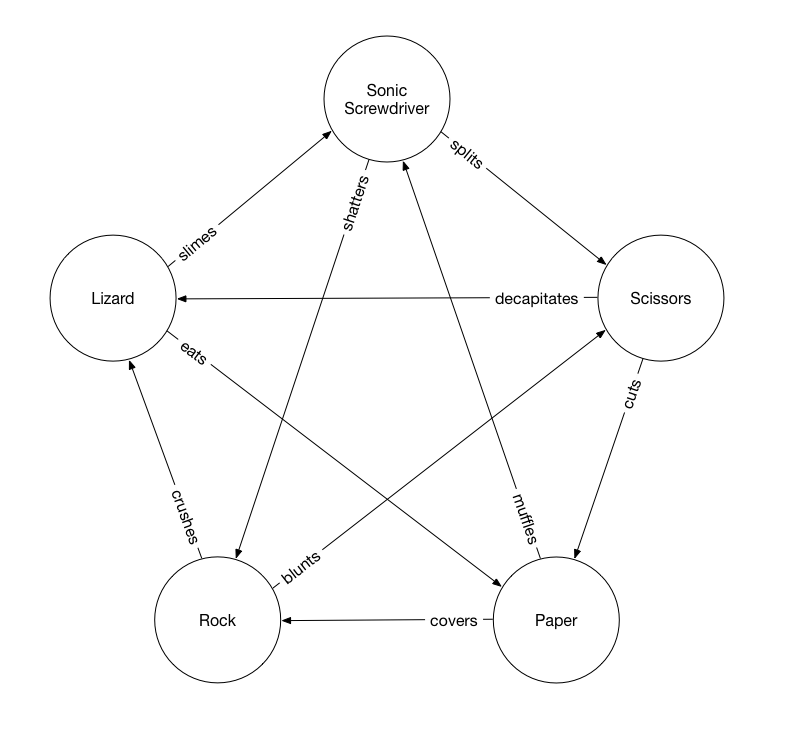 Rock, Scissors, the Sonic Screwdriver, and Large Hadron Collider can be used as tools. The Sonic Screwdriver, however, cannot defeat the Zombie because of the organic rule. Large Hadron Collider zaps Stupid things. Zombie, Rock, Invisibility Cloak, and Scissors are all Stupid. The Sonic Screwdriver, however, cannot defeat the Zombie because of this organic rule. Six and a half years ago, I brought unto this world a new, 7-hand-gesture game to extend the one made famous by Sam Kass. I have been truly pleased got a lot of fan comments and followers and shares from the original Rock, Papers, Scissors, Lizard, Zombie, Spock, and the Large Hadron Collider post. Someone even wrote a game in Java for it and it's even the subject of a University Lab Assignment! But to be honest, even then I was talking about extending it with Tea Cups and other such silliness. In fact, this blog came to a standstill because honestly, I thought, how could I top that? In any event, I sat on it for years, thinking I'd remain in the back reaches of the Internet as a footnote to history when one of my local book clubs, the Bowie Bevy of Brainy Books reviewed The Simpsons and their Mathematical Secrets (Singh, 2013), in September, 2015. There, the Singh mention's Kass's Rock, Paper, Scissors, Lizard, Spock as well as the astounding RPS-101, which features 101 two-handed gestures and 5050, often repeated verbs. Personally, I know 7 gestures could be tricky, recognize 9 may be a bit much, but 101? 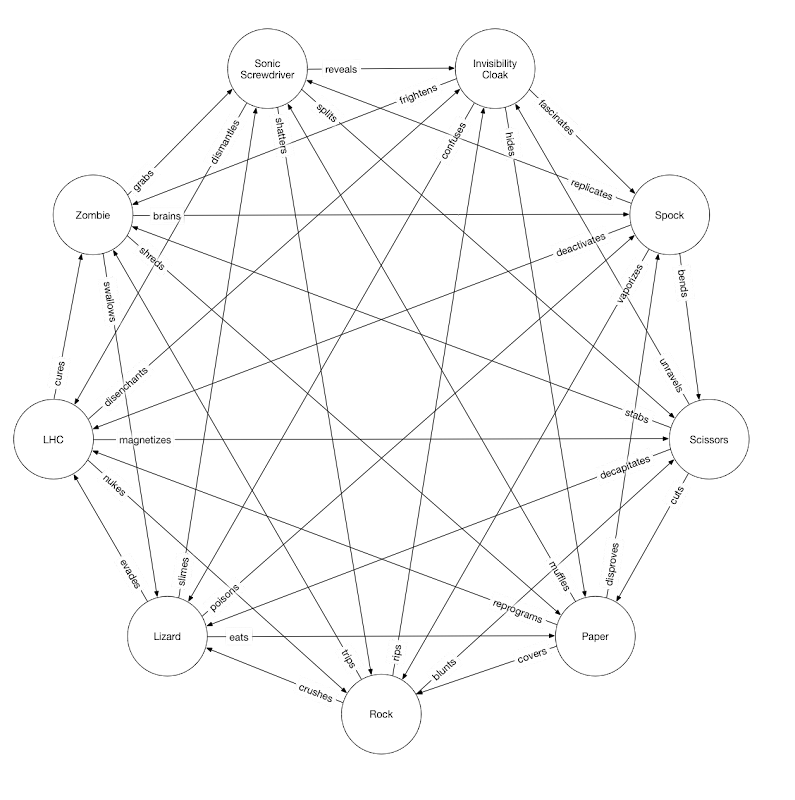 Also, I like the idea that each directed graph segment has it's own, unique verb. After all, Spock may deactivate a Large Hadron Collider, but only a Sonic Screwdriver could dismantle it. I also like the symmetry of the simply versions, with the clockwise win, and every other line being a win, then a loss, clearly showing it balanced. RPS-101, with the suite of 50 adjacent items all being losers is also a nice layout, especially when you have such a complex game, but I traditionally used this model for 7, and now I'm using it for 9. The first problem with extending the 7-gesture, RPSLZSLHC was to figure out what gestures to add. Being a big fan of Doctor Who, what could be more appropriate than a Sonic Screwdriver? Then, I figured I needed to balance that with something a bit more contemporary and figured what fun it would be if a player had Harry Potter's Invisibility Cloak at his disposal. Having decided my nouns, I needed 15 new verbs to relate the new objects to the existing ones. First, I decided that the Sonic Screwdriver doesn't work well against organic matter, as shown in the series. Conversely, I decided magic affects only organic matter, so the Invisibility Cloak would defeat organics. This left the Sonic Screwdriver defeated by 4 items, and the Invisibility Cloak defeating 4 items, meaning the Sonic Screwdriver would have to reveal the Invisibility Cloak. I wrote all these details on my phone; all that remained was to update my graphic. The problem was, I had created my original graphic in OmniGraffle, a diagram construction tool that I had a license for at the time. However, having since changed jobs, I no longer had access to OmniGraffle or the file I had saved for it. In other words, the original RPSLZSLHS.graffle file has been lost forever to the Internet gods. It took me a long time to accept that I would no longer have access to the file and thus not be able to modify it to add the 2 new gestures. Eventually, though, I had to give up hoping and just have to recreate the entire graphic from scratch on a new OmniGraffle instance on a new machine. It took me a while to figure out how to place my noun circles symmetrically but really it's just a fraction of 2π and sin and cosine to simulate the circumscribed circle around the polygon. You might say, then, it was as easy as pie! Of course, what's a hand gesture game without it's gestures? The Rock is a closed fist. The Paper is a flat hand, fingers together, palm down. The Scissors is a fist with the index and middle fingers extended (as in a cutting motion). The Spock is a ש (shin) or Live Long and Prosper or a Sontaran, as in fingers extended, with thumb separated from the index and middle fingers and those two fingers separated from the ring and pinkie fingers. The Invisibility Cloak is a cupped hand, palm up, with nothing inside, since the cloak is, after all, invisible! The Sonic Screwdriver is a fist with the thumb extended outward, toward your opponent, as if you're sonicing him. The Zombie is a limp-wristed gesture, with all fingers opened. The Large Hadron Collider, LHC, or just Collider, is a fist with the thumb and index finger extended, index pointing outward. This gesture superficially resembles a gun, since it is a gesture of the hadron particles gun which releases the accelerated particles into an increasingly rapid variable magnetic field. The Lizard is a C-shape, with the thumb on the bottom and the fingers curved above (as in a lizard's mouth). Paper reprograms Large Hadron Collider disenchants Invisibility Cloak hides Paper. Rock trips Zombie brains Spock vaporizes Rock. Lizard slimes Sonic Screwdriver splits Scissors decapitates Lizard. 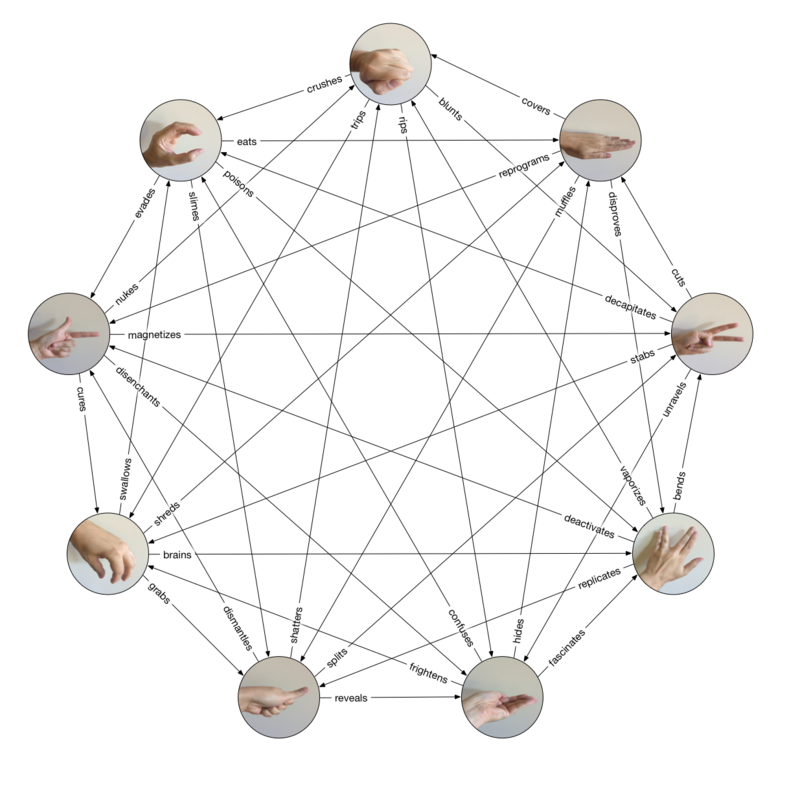 One other point to make is that, when inserting elements into the gesture graph, it's important to figure out where to place them such that not only is the graph balanced, as it would be given 4 defeats and 4 successes for each of the new gestures, but also symmetrical. This isn't as easy as it sounds and it took a bit of reorganizing to figure out the two new gestures worked best between the Zombie and Spock. It's always easiest to add gestures in connected pairs between existing nodes since the paired gestures will themselves have an implied ordering and that ordering will usually contradict one another (e.g. magic rule vs. organic rule) so what's a defeat for one is a success for the other, keeping things balanced and symmetric. What if Sam Kass hadn't been a Trekie? To be honest, much as I personally love Star Trek, more than anything I am a Whovian. So I've always been ambivalent as to the inclusion of Spock over the Doctor. Granted, what hand gesture would be enigmatic of the Doctor? William Hartnell, hands on his lapels? Colin Baker, stroking his cat pins? A celery stalk hand gesture? A fez gesture? In the end, one thing that almost every Doctor had in common (except Hartnell, C. Baker, and McCoy) was the Doctor's trusty Sonic Screwdriver. 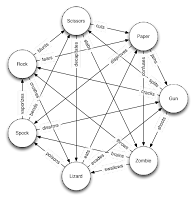 Of course, while it's nice having Spock and the Sonic Screwdriver play off each other, one has to ask, what if instead of Rock, Paper, Scissors, Lizard, Spock, it was Rock, Paper, Scissors, Lizard, and a Sonic Screwdriver? Fortunately, it's easy to just eliminate the two adjacent Spock and Invisibility cloak and two adjacent Zombie and Large Hadron Collider and still end up with a balanced game, just like Sam Kass's original, but with the Sonic Screwdriver in the place of Spock. I have a feeling Sheldon Cooper would approve! It may seem strange that I'd not update this site more than once in the past 6½, the truth is a lot of the reason for my absence is because I have spent all that time on the Affordable Electric Car NOW! blog writing extensively about electric cars. Indeed, some would say I am personally obsessed with electric cars, and love driving #CO2Fre Nissan LEAF, though I'm pining for a Tesla to call my very own—that Model 三 can't come soon enough! Interestingly, the symbol for an Electric Car is actually the same symbol for Spock. Well, technically, it's just the symbol that early Nissan LEAF drivers voted to use to greet each other. Personally, I find the official LEAF wave silly, but it is the same gesture and if that gesture is used for one EV, might as well symbolize all EVs. Thus, the only thing that needs to change is to replace the Spock verbs with EV verbs. Thank you for reading! See you again in 2023—maybe I'll have the Tea Cups by then! showed them. Covered myself in ice I did. oceans into polar caps and even removing the oxygen from my seas. This time, though, I'm taking a hostage, and that's you! 365 years to come up with some way of escape or else. Gaia, Third Planet from Sol. At first, the people of Earth didn't understand. It was a message encoded in their DNA, in everyone's DNA. And yet, when they searched the tissues of the long dead, they never found it. It was as if it had suddenly appeared and now everyone alive had it. It didn't encode for anything the bio-chemists could discern and they just thought it was new junk DNA. The geneticists thought it was epigenetics but couldn't find either a gene it activated or one that it suppressed. Eventually the cryptographers threw the series of As, Cs, Gs and Ts into various decryption algorithms. It was a Harvard graduate student from Senegal though that finally deciphered the genetic message. At first he was ridiculed and no-one believed him. And they took his eventual suicide a year later as proof. But then others tested his methods and came to the same conclusion. The Earth had given us an ultimatum, and it had been 31 years since it's initial discovery. Time was wasting! The governments of the world bickered. The conservative ones said it would cost too much. The liberal ones said we didn't know how. In the end, it was the third generation CEO of the Motorport Industries that put up the money for the first colony ship. After all, the Hubert family was the richest in the world, richer than most nations, all thanks to there non-addictive pleasure drug, Orgasma. The first refugees were sent to live among the prisoners and astrophysicists of the Moon. The Moon was, after all, well developed by the aspiring nations and was the perfect place to call a new home, if your idea of home was a six by six jail cell or an equally luxurious astronomer's pallet on the dark side of the Earth's only major, natural satellite. But the new inhabitants made due and soon the Moon became as gentrified as Australia. By contrast, life on Mars was hard for the first pioneers. They came to prefabricated domes which had been build by a fleet of robots which preceded them. They grew genetically engineered crops which thrived in the acidic Martian soil. And soon more came. Domes sprung up everywhere, from the icy poles to the dusty equator. Eventually, the terraforming began. They couldn't figure out how to protect it with a magnetic shield like Earth but they generated a new atmosphere, full of Oxygen and Nitrogen, just like back home. People left their domes and walked on Martian soil, breathing the fresh Martian air. It was getting crowded, but fortunately that wasn't the only place humanity subdued. They had started on Ceres around the seventy-seventh year of the message. Then Pallas and Vesta a few years later. They couldn't get those asteroids to hold an atmosphere so they just wrapped the entire celestial body in a contoured shell. They mined the asteroids for minerals and eventually were even able to plant crops. The highest high jump ever recorded was recorded when they held the Olympics on Ceres. Europa, Ganymede and Callisto were next. They didn't bother with Io―they said it was too volcanic. They found the surfaces of these moons too hostile and prone to Jovian radiation, so they cracked their icy surfaces and created sea colonies that lived off geothermal energy generated by the tidal forces created by Jupiter's massive gravity. Much as they'd hoped and tried in a series of robotic missions to prove, they never found even microbial life in those anoxic waters. They even considered Titan but the robots just couldn't get the place warm enough for humanity's needs. Cloud City though became their capital. Miles above the scorching Venusian surface lay a fleet of floating pallets. Humanity may not yet have reached the ability to construct a Dyson's Sphere and become a Level Two society, but they were well on their way to Level One. They had painted the lower surfaces of their levitating platforms jet black to absorb the energy from the lead-melting surface and use that heat to power their hovering stabilizers. And the upper surface of the habitable shell was covered in Mylar to reflect the radiant solar energy. Eventually, the whole atmosphere of the planet was covered with these rafts. The planet was beginning to cool, but not in time for all of humanity to escape―they had only one hundred and sixty-six years left. By the time Mercury One was established in the rim of a crater on that rocky world, the first generation ships were already on their way to distant stars. Each ship carried a billion people and the knowledge of 10,000 years, all in compact storage and Petri dishes full of genetic material. Of all the various planets found by telescopes from Parinal and Kepler to Lunar Seven over the past few centuries had yielded up to 300 new, potential homes for humanity in the extrasolar void. The ships sailed on, alone and voiceless, only to land hundreds of thousands of years hence. When the time finally came, humanity numbered less than 10,000 on its former home. Those that remained determined to die with their planetary mother. They couldn't be budged. They devolved, becoming barbaric, loosing much of their rich and robust language. They fought with simple tools, and hunted wild game. Their gracile humanity had left them; they were savages. Not quite animal yet, but rapidly they approached just another species on Earth in just a couple generation. It was a week after the Vernal Equinox when they saw it through the telescopes at Aphrodite, Cloud City. Etched upon the surface of the blue-green marble they'd once called home in every language man still spoke. She taunted them with those 2 words, but by then they didn't care―it was Gaia who really played the fool. Eviction Notice by Jeffrey C. Jacobs is licensed under a Creative Commons Attribution 3.0 Unported License. Scisors cuts Paper covers Rock crushes Lizard evades Large Hadron Collider cures Zombie brains Spock bends Scissors decapitates Lizard poisons Spock vaporizes Rock trips Zombie shreds Paper reprograms Large Hadron Collider magnetizes Scissors stabs Zombie swallows Lizard eats Paper disproves Spock deactivates Large Hadron Collider nukes Rock blunts Scissors. Brains are found in Spock, Lizard and written on Paper. Rock, Scissors and Large Hadron Collider can be used as Tools. Zombie, Rock and Scissors are all Stupid. The Paper is a flat hand, fingers together. Note: The likely reason Paper beats Spock is that the paper contains writing which contradicts the word of Spock, making him illogical and therefore not the real Spock! Also, Sam Kass prefers to say Spock smashes Scissors and Rock crushes Scissors. Smashing anything would be too undignified for Mr. Spock IMHO, and as Think Geek suggests bending the Scissors; I prefer this. As for what the Rock does to the Scissors, I have always heard it as blunt, and using blunt avoids repeating the verb to crush. 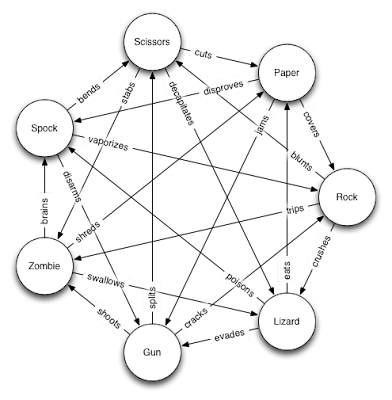 Although those rules are fair (3 win, 3 loose and one ties for a given gesture), they don't lend themselves well to the recursive symmetry of Rock, Paper, Scissors, Lizard, Spock so I suggest although the order is Rock, Paper, Scissors, Lizard, Zombie, Spock and the Large Hadron Collider, the game be played Scissors, Paper, Rock, Lizard, Large Hadron Collider, Zombie and Spock. 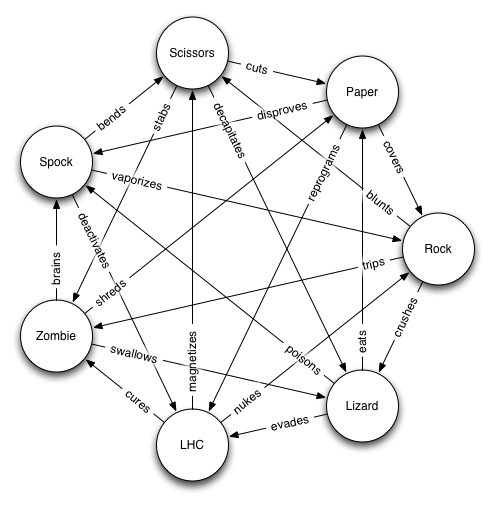 Since the suggested gesture for the LHC is very similar to a gun, and Rock, Paper, Scissors, Lizard, Zombie, Spock, Gun is easier to say than Rock, Paper, Scissors, Lizard, Zombie, Spock and the Large Hadron Collider, here is how the rules would read if the LHC were replaced by a Gun. Zombie extracts Spock's Brain (and takes it to Sigma Draconis VI). 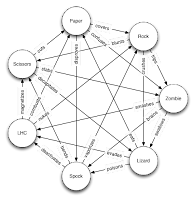 Unfortunately, this change does not create a symmetric graph like the original version of Rock Paper Scissors Lizard Zombie Spock and the Large Hadron Collider, even if it is balanced. For this reason, and for the reason that a better verb has been suggested for how the Zombie defeats a piece of Paper than the original ones, I prefer the original rules of the game. Now, if we replace the Large Hadron Collider with the more basic Gun design, as above, and we allow that nasty old Paper to defeat our intrepid Zombie once more, we are left with a different conundrum. Whereas it's easy to imagine a Zombie smashing an LHC, it's less reasonable to consider him doing so with a simple Gun. In fact, it is more likely that after fiddling with the gun for a while, the Zombie is more likely to shoot himself re-dead than anything else. So, that leaves the Scissors and the Rock that the Zombie will now be able to defeat. Since I like the idea of the Zombie also being stupid enough to stab himself with the child-proof, safety Scissors, I decided to change how the Zombie interacts with the Rock. Thus, I simply state that the Zombie picks up the Rock and throws it away, not bothering to fret with it this way or that. That now leaves the Rock and the Paper to deal with. Superficially, it would seem blasphemy to even consider changing how the traditional Rock interacts with the proverbial Paper. But, if you throw a Rock at a piece of Paper, which one is going to give? Obviously the Paper! And if you wrap a Rock in Paper, then try and lift that Paper, a sufficiently heavy Rock will just rip its way through the Paper and onto the floor. So doesn't it make more sense to have Rock beat both Paper and Scissors? Now, that wouldn't make the 3 hand gestures game very fun: One, two, three, shoot… Rock tied again!? 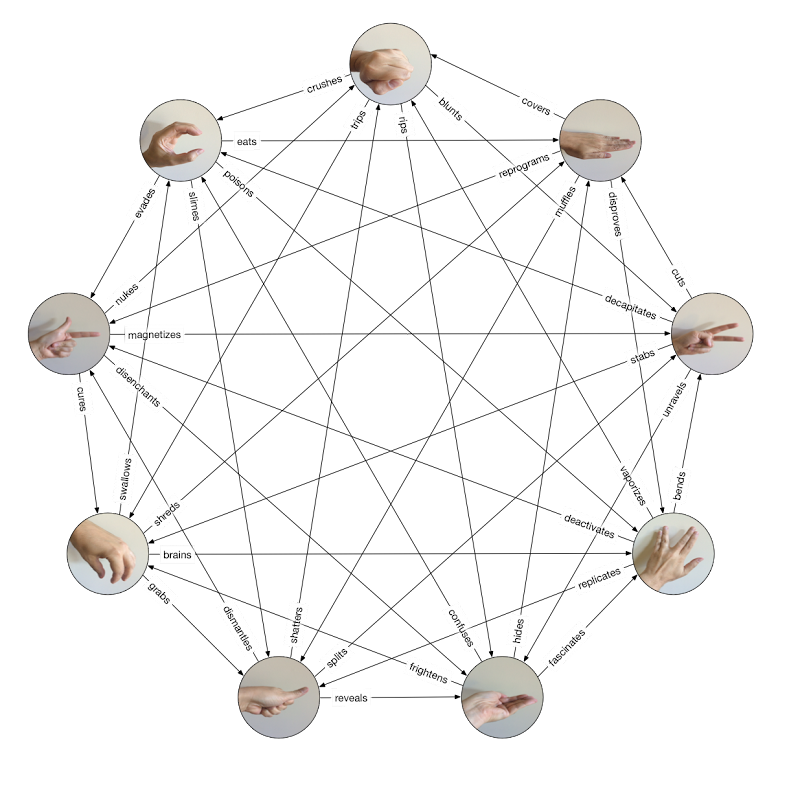 But with 5 or 7 gestures, it now becomes possible for the old Rock of yore to become master of both Paper and Scissors while still being defeated by the 2, or 3 of the 4, remaining gestures, respectively. I therefore present a set of alternate rules involving the Gun. As with the previous example, this modification to Rock Paper Scissors Lizard Zombie Spock Gun lacks the symmetry of the original, and as it also lacks the Large Hadron Collider in it, it is my least favorite modification, despite fixing what I like to think of is the problem with Paper and Rocks. Starship is suddenly down at the moment, and I usually do bloggish stuff there, so I've not much to say at the moment. My mind is simply on a single priority of a few parts. 1) My beloved's father has a confirmed case of what seems to be cancer of the esophagus. 2) We are in the middle of buying a house. 3) We plan to soon be married. 4) She might need to visit her dad on the day of closing so we don't know how that will work. 5) I need to move money out of the Annuity and RothIRA to pay my share. 6) We hope they don't build that road in our back yard! 7) My dear friend George is suffering from the same type of cancer that the other George [Harrison] had on 29 Nov 2001. 8) We need to have kids. 9) This Friday we submit our work As-Is, and it's not in the condition I would like. So compared to these things, anything else must be trivial. None the less my mind also dwells on the events of last night. For the sake of our privacy I will not speak the details, but needless to say it was an experience I could not have remotely imagined... Anyway, happy birthday Anu!